My apologies, I neglected to create the actual poll! It’s there now – if you’ve already voted in the comments, that can be your vote…or you could be sneaky and vote twice. Your choices for the Gen 3 heir are all teens, so it’s time to choose! None of them have LTW yet, they will receive it on their YA birthday. Antoine and Tess both have grey eyes, though in certain lights they look blue; all three children have the same eye colour. Maura has Tess’ overall head shape, mouth, nose and hair colour; Antoine’s skintone, eyes, chin and jaw. Angela is a complete face clone of Tess, with Cristina’s grey skinramp and Nadia’s red hair. Gabriel has Tess’ chin and eyes, Antoine’s jaw, nose, mouth and skintone. Random black hair. Such a tricky heir poll. Do I vote by saying in the comments? I choose Maura. There is just something about her I’m drawn too. And that pic of her, she just looks so maudlin, so desolate. Plus she is so pretty. Oops, forgot the actual poll. It’s up now, if you want to vote again, but I’ll count the comment ones also. I didn’t realise that, but you’re right, she does look pretty desolate in that photo. Very much the tortured musician, Maura. Are we voting here in the comments? If so, I have to vote for Gabriel. Don’t get me wrong, Maura is gorgeous but I feel like the majourity is already going to vote for her so I’m going with the underdog. 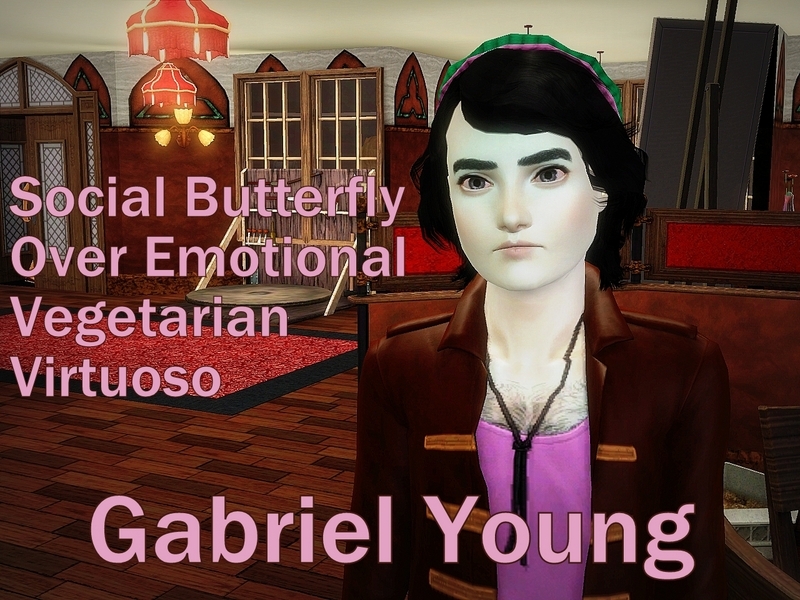 Plus, I think Gabriel’s trait combination is rather interesting. Aaaaand it also helps that he’s adorable. Sorry, you can now vote in the actual poll, if you like. I love Gabe, and you’re right his traits are a great combo. Never played with Social Butterfly before. This is so hard. D: Um. Um. I want to vote for Maura! Such a difficult choice. I am going for Maura, she has such a lovely face. Good golly. I do like Gabriel a lot, but I still vote Maura because she’s just so otherworldly. And I was allowed to vote although I’m late! Wooo! Voted, naturally I had to pick Maura. She’s so pretty! And I think she would look great with Chadwick lol <3. I would so love to get some Langurd genes in here. But he has grey eyes, like everyone else in the family.